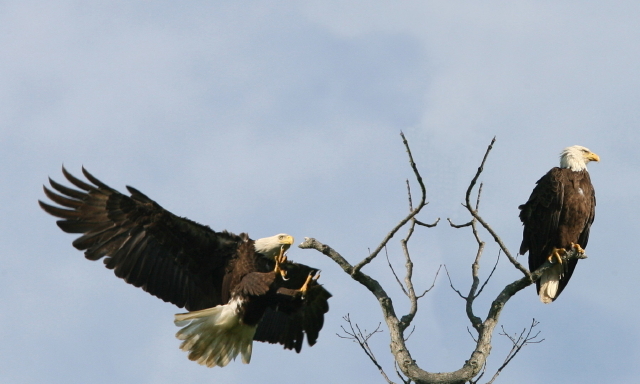 Susquehanna 2006 is a five month photo study of a nesting pair of bald eagles along the Susquehanna River Valley. I've been following this pair at their current location since the year 2000. A quick recap goes like this. 2000....two chicks, 2001....two chicks, 2002....three chicks, 2003....two chicks, 2004....nest failed, eggs were lost, female was lost and a new female appeared, 2005....two chicks from new female and in 2006....three chicks. And yes I've given this successful pair names, Susque and Hanna, with the new female being HannaII. 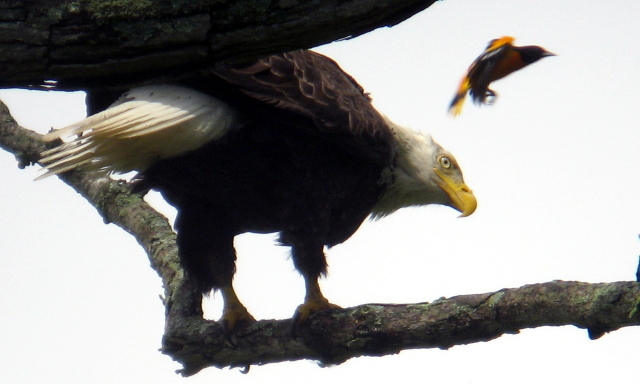 Now a review of the Susquehanna 2006 Nesting Season. In early February the adults were observed adding branches to the nest. Mating was seen on Valentine's Day. Incubation by the male and female started February 26. Eggs hatched around April 1. Two chicks were spotted by mid April, with the third appearing May 1. Most of their diet was fish, but we did see a big eel and road kill squirrel. 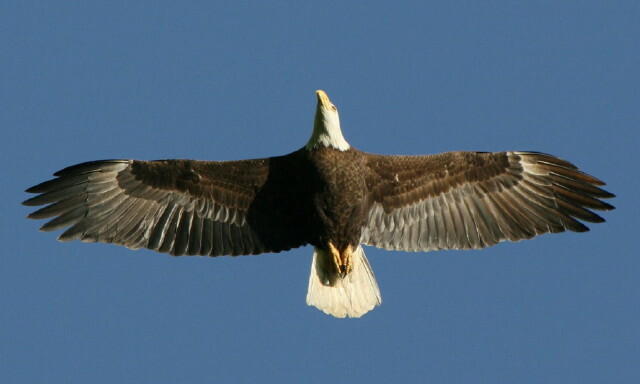 Eaglets grow fast, obtaining the size of the adults or bigger by flying time. The three began branching out in their birth tree June 10. First born fledged June 20 with the others following by June 24. Visits to "The Tree That Grows Eagles", as I call it, by the family will slow during July. With luck, maybe I'll spot that family of five along the Susquehanna shores during August or September for one more photo. The rest of Susquehanna 2006 will contain photos with captions and animated photos. The Photo Gallery also features shots from this nesting season. Susque heads back to the nest to continue incubation after feasting on a catfish lunch as HannaII looks for left overs.....March 8, 2006. Our nesting male, Susque, seven years running. HannaII leaves her favorite perch. Coming out of the front of the nest toward the eagle paparazzi was rare this year. The female returns to a good lookout after driving off an intruder for the third time. 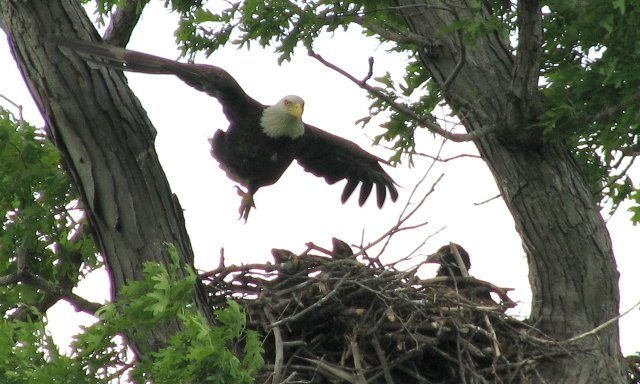 To fly comes natural for the eaglets, landing takes practice...practice...practice. 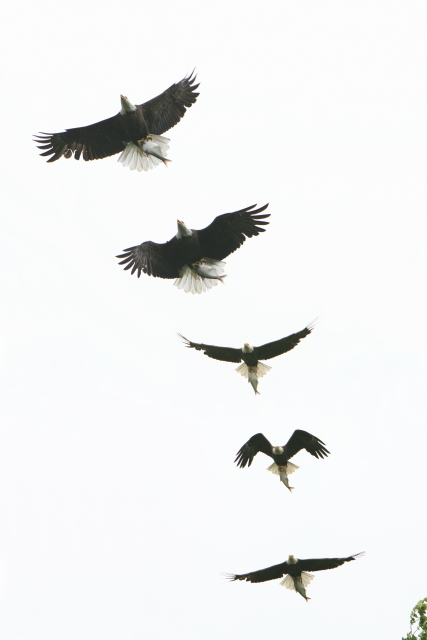 All eaglets were flying by June 24, 2006.